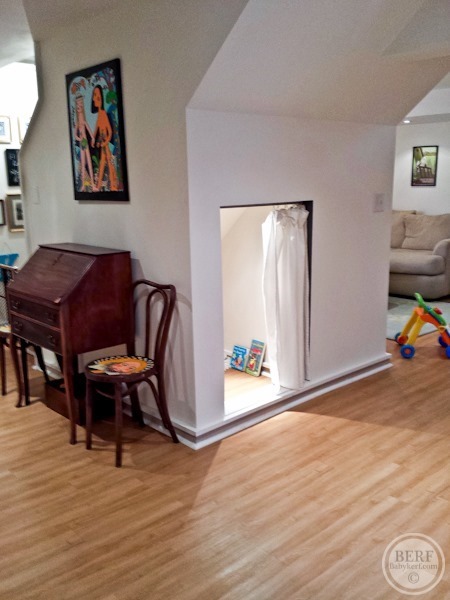 In our basement family room, tucked under our stairs we have a little finished space for storage. In the years past it has held everything from old paint to horseshoe sets to beach chairs to extra baby toys. 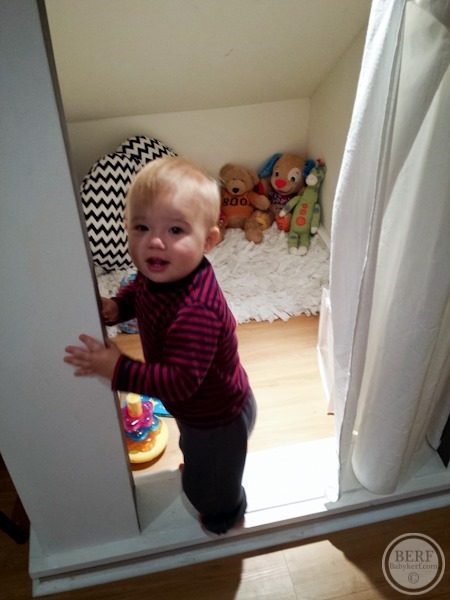 And now it’s a fun little hideout for Mazen! I filled it with some animals, books and toys. And I finally found a good spot for that fluffy rug I bought last year! 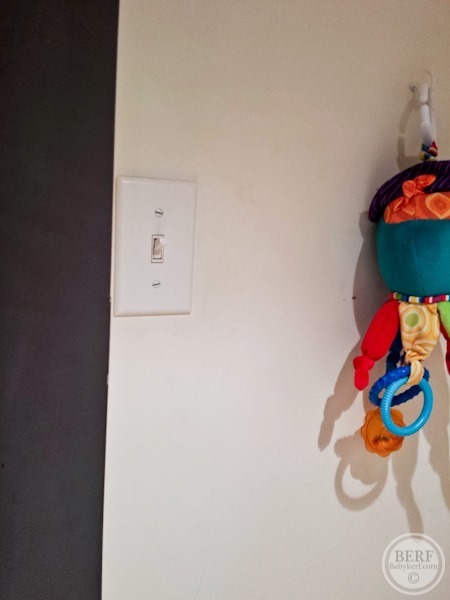 I love that it has a light – with a baby-height light switch! Love this!! They are just beginning imaginary play now, what a great space for him! I love the use of that space, what a neat idea! I also love the chevron pillow cover, is that a Boppy? Best idea ever. I had one of these as a child, but it was just a crawl space in the unfinished attic. I can’t tell you the number of adventures my brothers and I had in there! 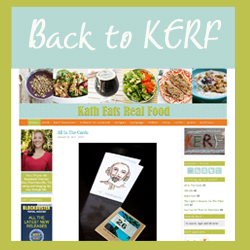 Awesome job Kath! 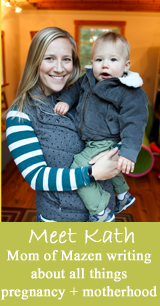 Our kiddos are the same age and have hit all of the same milestones and I’m curious if Mazen has started hitting yet? My daughter is in daycare and thinks that if she wasn’t in daycare then she wouldn’t be hitting. I would love to see a post on this. Right now I’m telling her that it isn’t nice to hit and setting her down but she still laughs. It’s his Harry Potter closet! 😉 So fun! I thought that too! 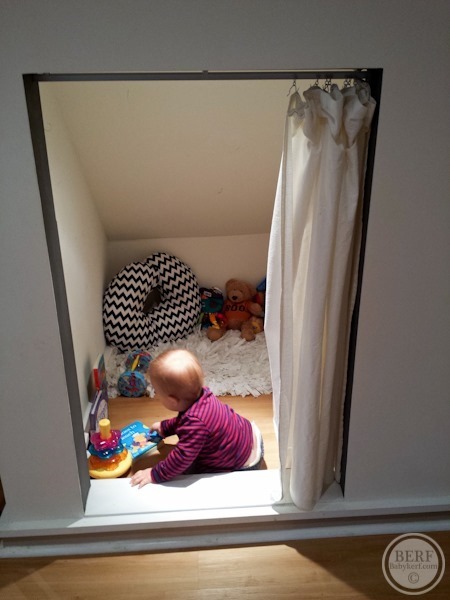 His own “cupboard under the stairs”. Too cool! Love it. Love the whole idea. We have this kind of space too but with a full size door. I am not sure what to do with it but right now its our Christmas/Cleaning supply closet. 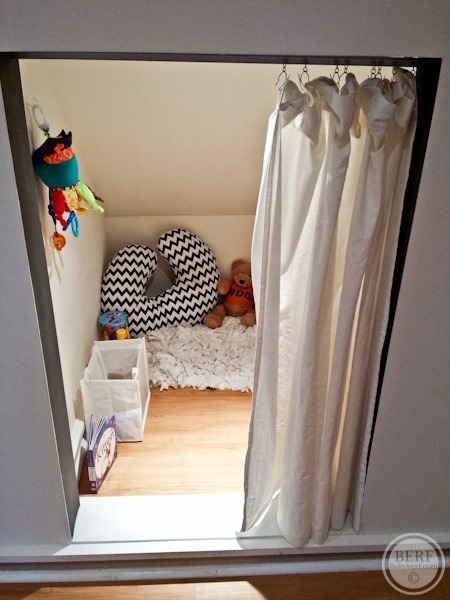 When I was little I used to love hiding/playing in little nooks & crannies. It’s Mazen’s own little room. Love it! The big closet in my bedroom was my hideout. Glad Maze has one too! 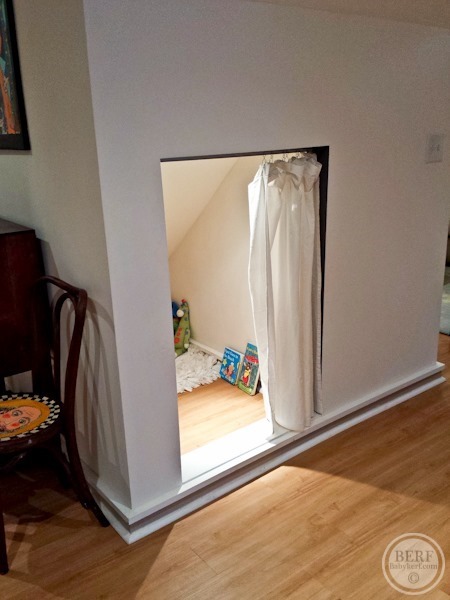 By the way, this reminds me of Harry Potter and his cupboard under the stairs. Love it! That is awesome! I wish we had a space like that, even though it’ll be a while before our guy should want/need a place that like. Awww. Reminds me of Edie’s little hiding spot. So cute and a perfect hideout!! 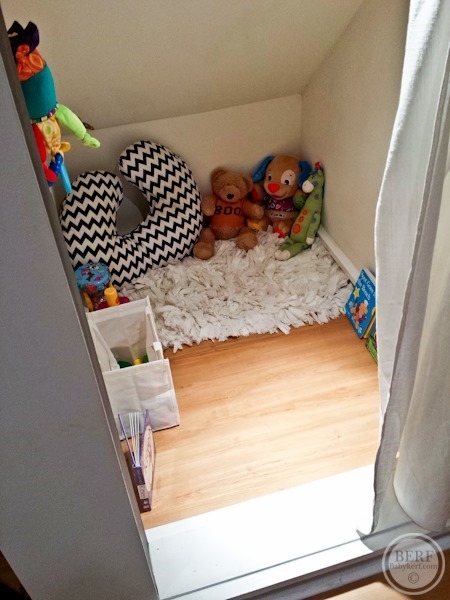 Reminds me of the cozy space from the children’s book, “Don’t Touch My Room.” (pretend it’s underlined) Cute!